When early settlers came to the Big Walnut area it was a vast forest of very large trees. Following the melting of the glaciers, pines grew in the area. As the area warmed, the evergreens were replaced by deciduous trees which greeted the first settlers. The large trees were so close together it was often impossible to get a cart between them. There was a prairie or meadow in Berkshire Township without trees. This was only a half mile by a half mile but that made it very enticing to the early settlers. Swamps caused by beaver dams and felled elms were scattered and not big or quickly found by those passing through the area. The local virgin forests consisted of an assortment of oaks, hickory, black and white walnut, ash, birch and sugar maple trees. The exception was the high ground between Little Walnut Creek and Big Walnut Creek where only second growth white oaks were found. Baskins 1880 History of Delaware County attributes this to a tornado and only the oaks reseeded. It might hve been a fire or even a flood but the result is the same. The large trees prevented Native American tribes from building hogans in this area but is made for great hunting with an abundance of wildlife. Even into the early 1900s, folks told of squirrels being able to travel in trees from Condit to Sunbury without touching the ground. The large trees also kept the sun from hitting the ground. Being without sun throughout the summer had adverse affect on the settlers, especially the women as noted in Conrad Richter's The Trees, a well documented novel about the settling of Ohio. The trees in the virgin forests were so big they could not be easily cut by ax or saw. Settlers had to cut a notch around the tree (girded) which prevented the sap from reaching the leaves and thus killed the tree. This process allowed the sun to get to the ground and allowed vegetables to be planted around the base of the dead tree. The soil was rich from years of accumulated leaves and other vegetation. It became a high priority to clear the trees making areas to graze animals, remove hiding spots for wild animals and Indians. Many were used for homes. Some trees were so bif a two story house could be made from a single tree. I know of two homes along Joe Walker Road which were examples made from black walnut trees found on their property (the McGee home was lost to fire a few years ago). Trees close enough were rolled into waterways to float away. Others were laid out like spokes of a wheel with a large fire built in the hub. As the wood burned, the trees were pushed into the fire until all was gone. This burning of the butts was often a social outing as several families helped with the process and enjoyed company and good food. The desire to remove the trees was so great that areas became treeless such as the villages. 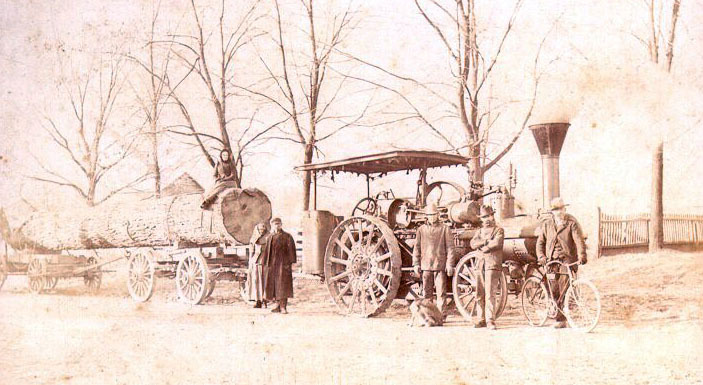 In Sunbury Nathan Marble, a local carpenter and coffin maker, was hired in 1880 to plant trees on the public square. He chose to plant trees in a circle of eight on each quadrant of the square. These trees represented the trees found in the forests by the settlers. When Sunbury was having financial difficulties in the 1970s, the Marble Tree Fund was founded for the care of the trees. Ten years later the village reclaimed care for the trees.